Art and Heart: The World of Isaiah Sheffer - BUY THIS DVD! One of New York s great Renaissance men, Isaiah Sheffer left an indelible mark on music, theater, television, and culture across three decades in the Big Apple. He was the founder and artistic director of Symphony Space, the originator of Bloomsday on Broadway, and the comic genius behind the Thalia Follies. He hosted the popular WNYC program Selected Shorts and earned an Emmy nomination for his Road to the White House series on NBC. An actor, director, musical librettist and lyricist, and cultural entrepreneur, he was also a husband and father, and a mentor to many. 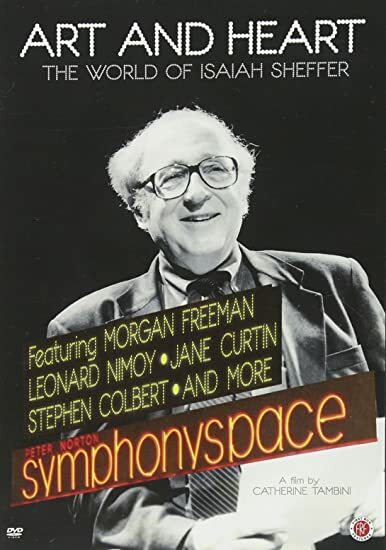 A celebration of Isaiah Sheffer's life and work, this warmly affectionate documentary includes archival material, stage performances, and interviews with friends and colleagues including Morgan Freeman, Stephen Colbert, Leonard Nimoy, and many others. THEN SEND IN A COMMENT ABOUT YOUR FAVORITE FUNIMATION TITLE (you may click on artwork above for a refresher) PLUS YOUR NAME AND ADDRESS TO contests@efilmcritic.com or WeLoveHBS@aol.com. (Just one e-mail please.) Put [b]"I LOVE THE THALIA FOLLIES" in the subject line and cross your fingers. We will draw names and one of the prizes could be yours. Only 1 entry per household.